Interior, Blue Mosque, Tabriz, Iran, between 1911 and 1914. Entrance of the Blue Mosque, Tabriz, Iran, between 1911 and 1914. We've recently received a collection of diaries and photographs by the Presbyterian missionary to Iran, Thomas Kirkpatrick. 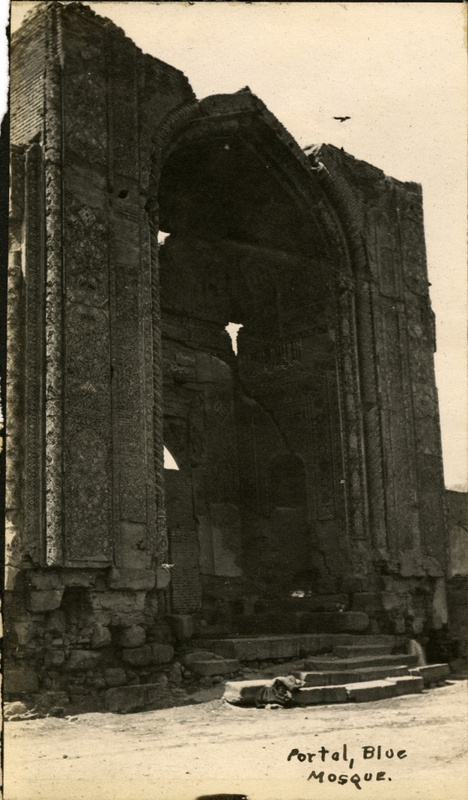 Assigned to evangelistic work in Tabriz and Urumiyah in 1911, Kirkpatrick traveled throughout the Caucasus, taking photographs. His photographs reveal an interest in Persian rural development, street life and architecture, as in these images of the Blue Mosque in Tabriz. Built in 1465 by Jahan Shah, the mosque was largely destroyed by a 1799 earthquake. The iwan, seen here, remains largely intact, and is today surrounded by new construction begun by the Iranian Ministry of Culture in 1973. 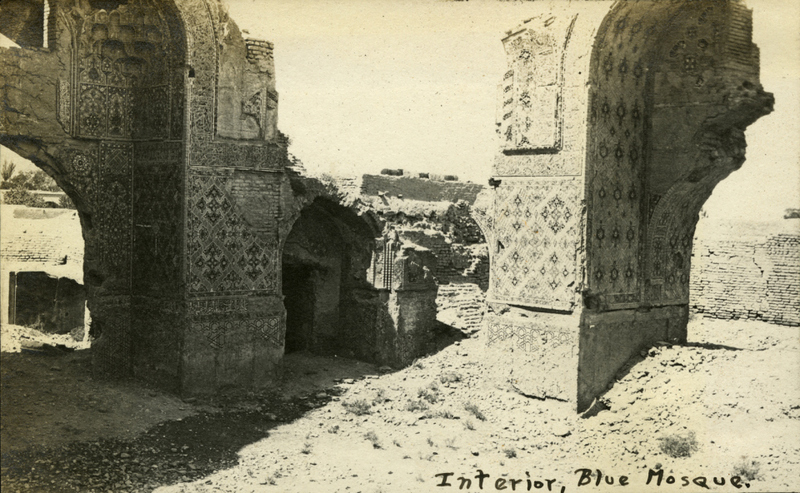 Kirkpatrick's photos show the mosque still in ruin. 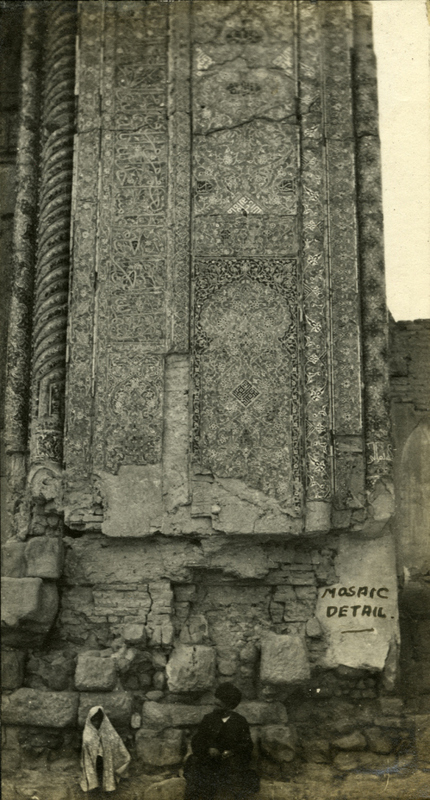 Detail of mosaic, Blue Mosque, Tabriz, Iran, between 1911 and 1914. Kirkpatrick served in Iran during a tumultuous period. His photographs and diaries bear witness to the aftermath of the Iranian Constitutional Revolution , including retaliatory violence between royalists and supporters of the new Majlis . They also document the geopolitical stresses which would culminate in the outbreak of the First World War. Kirkpatrick relates rumors of raids in the Caucasian countryside, attributed to Turkish or Russian soldiers. In another account, a Russian official describes the differences among the great powers vying for influence in northwest Iran: "The Americans bring schools and hospitals; the Germans, factories; but the Russians, only bad women." We're grateful to the descendants of Thomas Kirkpatrick for donating the Kirkpatrick family papers to us. You can find more resources about Presbyterians in Iran in our online catalog, CALVIN .